Area rugs are a great accent for hardwood and tile floors, especially when they complement the furniture and existing carpeted areas. When you want something to make your floors “pop”, then an area rug can do the job. But don’t think that area rugs stay beautiful and kept on their own. They require the same quality of care, if not more, than your carpeted floor. Depending on the kind of rug you have, different approaches to cleaning and upkeep will be required. For example, antique or braided rugs need a different approach then synthetic fabrics or sheep fur. Here, we’ll talk a little about some basic upkeep tips for your area rugs and follow that up with things to think about when cleaning them. Vacuum regularly. Use a vacuum with an adjustable pile brush and, if possible, an upholstery attachment to get into the fibers. If you don’t have an upholstery attachment, then use a carpet brush to work dirt out of taller piles. Take the rug outside and shake it out occasionally. Some area rugs are suitable for beating with a whisk or flat instrument to knock out dust, but a good shake out for dust and particles can help freshen it up. Rotate the rug 180 degrees at least twice a year. This can help keep the rug from wearing unevenly and reduce uneven color fading from exposure to the sunlight. Different rugs are made of materials, not all of which react the same way to cleaners or cleaning tools. If you have a variety of rugs, then know that you won’t have a once-size-fits-all cleaning solution. Different rugs are made differently, which impacts how you clean them. A manufactured synthetic rug won’t clean the same way a hand-woven or braided rug, and neither will need the special care an older or antique rug calls for. Some rugs require dry cleaning, and a wet-cleaning approach could actually destroy them. 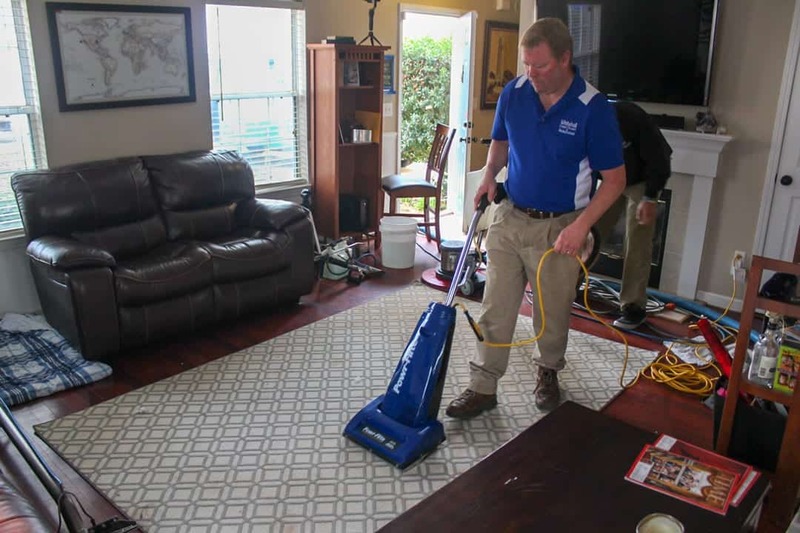 With all that in mind, a big question regarding your rug cleaning project is whether you should take the chance of cleaning your own rugs or hire professional help. Vacuum and brush your rug. Shake it out if necessary. You should remove as much hair, dirt, and dust as possible. Determine your cleaning solution. There are specialized cleaning solutions available at most department stores and in online storefronts that are cost-effective and will clean out odor and dirt from the rug. An alternative is to use a mild dish soap or other natural cleaning agent diluted in cool-to-warm water. DO NOT USE HOT WATER, as hot water can have adverse effects on the fibers of the rug. You don’t wash all your clothes in hot water, do you? This is the same principle. Determine the colorfastness of your rug. Take some of your cleaning solution on a small corner of the rug, where it won’t be notices. If the colors run, then it isn’t safe for cleaning and will damage the color of the fabric. Using a scrubbing brush, work the solution into the fibers to form a lather. Don’t oversaturate the rug, just use enough to get water and soap into the fabric. Let the solution sit for 5-10 minutes. Take the rug outside and use a hose or sprayer to rinse the soap from the rug. If you have a carpet cleaner or a wetvac, use it to pull excess water from the fabric. Let the rug sit outdoors until completely dry. The above cleaning method is a straightforward approach to cleaning rugs, but there are plenty of times where self-cleaning is not a good approach. Antique rugs, for example, are typically delicate and can’t stand up to cleaning chemicals or machines. Likewise, handcrafted braided rugs or Persian rugs should definitely not be cleaned at home. In these cases, it’s best to get a professional cleaner to come in and handle the rug. Professional cleaners typically specialize in carpets, rugs, and upholstery, which means that they are knowledgeable on how different fabrics hold up (or don’t hold up) to cleaning chemicals, cleaning methods, and different kinds of cleaning machines. These professionals also have experience working with older furniture and rugs and applying gentle cleaning methods to keep them healthy and attractive. The main difference will be cost. More likely than not, you’ll save some money cleaning your own rug. But with that savings upfront, you also sacrifice control and quality. So, what’s the big deal? If you have a home full of synthetic rugs that are replaceable, then there isn’t one. You could follow the instructions above (or use a carpet cleaner) and probably do OK. You’d still want to do the colorfastness test no matter what, because there is no telling when a chemical can obliterate a rug. In any other case, you probably want to go with a professional. That’s because cleaning can be a traumatic event for your rug, so delicate or valuable items should be treated as such. And a professional cleaner can provide the proper care that your rug needs to stay intact and clean.